Hos Dorte: Pop It Up, Mid way reminder for HM&F. What a lovely card Dorte! Great stamp! fun and gorgeous card Dorte. Dorte, it's a sweet image. Nice CAS design, patterned paper looks great. Just adorable Dorte, I love your design and gorgeous Papers. I love the Popped Up element of the cute image!!! 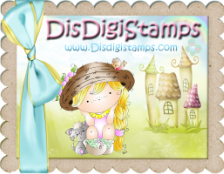 This is a fabulous card Dorte, such a lovely image and great CAS design. This is so very cute! Love how you popped up the ornaments, and you are right, that image really doesn't need much in the way of embellishing. Very cute to attach the "Merry" to the string of ornaments. Thanks for playing with CSAYL. It is a really beautiful card! What an adorable holiday card, Dorte! I love the dimension you added to the ornaments. Thanks so much for playing along with the Simon Says Stamp Wednesday Challenge: Keep It Clean and Simple! Lovely Christmas card. Thank you for sharing it with us at Gruffies & Guests. Fabulous card! thank you so much for joining us at Gruffies & Guests, hope to see you again and good luck in the draw. Oh Dorte your card is really wonderful i like it so much and the pop up elements looks fantastic. Gorgeous - love the depth you've added. This is such a beautifully sweet Christmas card! I love the image! The popped up ornaments look fantastic. Thank you for sharing your gorgeous creation with us at 7 Kids College Fund! Wow such a wonderful CAS card ,lovely image and elegant card design. Thank you so much for entering our SSS challenge this time.i hope you return soon with another stunning card!